Catherine, one of the contributors to this Second World War Blogspot has recently (December 2009) had a book with three fictional tales about the latter part of the Second World War in the 'Alpes-Maritmes' region of southern France. 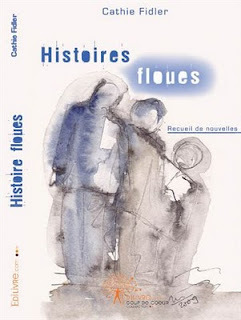 Written in French and entitled 'Histoires floues' (which one may translate as 'Fuzzy stories') the book is composed of three stories about survivors of the Nazi Occupation and their descendants. Based in the area where Catherine lives, the themes in the stories have been thoroughly researched. They are set within the context of what happened in France during the Nazi Occupation of the Southern Zone, and the remembrance of these years, which may be fuzzy (or blurred if you like) looking back from the present time. Well done on getting the book published, Catherine! As you can see above, I have the Comments permissions set to 'Anyone - includes Anonymous Users', I think the other choices are rather too restrictive. To stop auto-spammers contributors have to manually copy a sequence of obscure letters. It seems that a persistent oriental spammer is not deterred by this and is taking advantage of our free access, so for the time being all comments will have to be approved by me before they can be read by the public. I am sorry about this. The Normandy Council for Veterans is based in Caen, Calvados (Normandy), France. In June 2009, coinciding with the 65th Anniversary of the Normandy Landings, known surviving veterans were awarded a commemorative ‘bar’ (or badge). Many Normandy Veterans made the pilgrimage to Normandy for the commemorations and a number of ceremonies were arranged to honour the veterans. Calypso - used as a ferry between Malta and Gozo in the 1940s. Jacques Cousteau's research vessel for 46 years, the Calypso is now being restored at a French shipyard. Thanks to the late Captain Jacques Cousteau's films and television documentary seriesm the nautical research ship Calypso has been turned into one of the most famously filmed and well-known vessel in the world. Prior to Capt Cousteau's acquisition in 1950 when she was found in a Malta dockyard for surplus ships, she had been a World War II minesweeper operating with the 153rd Minesweeping Flotilla. Built in Seattle, she was launched on March 21, 1942, Calypso was part of the American Lend-Lease scheme. In February 1943 she sailed from Seattle bound for Gibraltar via San Francisco and Freetown - a voyage of 16,000 miles. She took part in the initial assault convoy to the beaches of Sicily in Operation Husky escorting and supporting the vast Allied invasion, sweeping close to the beaches to enable the landing craft to move in. In 1944 she was renumbered BYMS 2026 and based in Taranto, Italy. She was decommissioned in 1946 and laid up in Malta where she was acquired by Joseph Gasan, a Maltese businessman who used her commercially for a short period as a car ferry in the 1950s. 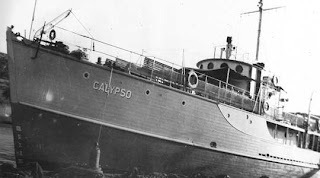 Later her name was changed to Calypso G.
It had been Captain Cousteau's wish that Calypso would be restored to her former glory and end her days in the Mediterranean where he first clasped her wheel in 1951. The modern day 'Ben-my-Chree' ferry going into Douglas harbour, I.O.M. During WW2 civilians who were born in enemy countries were sent to internment camps in the Isle of Man. Prisoners of War from the Axis countries were also sent to the island and detained in POW camps. 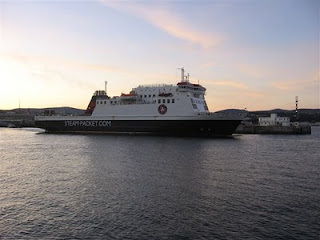 Many of these people travelled to the island from mainland Britain in one of the Manx Steam Packet Company vessels, such as a previous 'Ben-my-Chree'. During the Second World War about 3000 men from Newfoundland (now part of Canada) crossed the Atlantic to work as loggers in the British forests to help the war effort. The vast majority of the unit’s members were based in or near forests in Scotland and the English Border counties (i.e. Cumberland and Northumberland) and worked outdoors in all weathers. The above photograph shows a view towards some of the wooded areas of Cumberland (English Lake District), one area where the Forest Unit worked during the war. Seasonal Greetings to everyone ! A hearty Happy & Healthy New Year to everyone !